What exactly is an “abstract photograph”? The question has been answered by hundreds or more, and no doubt, many of those who have offered answers are more qualified to do so than I am. But I’m not as interested in defending my stance on what is and isn’t abstract photography as I am in looking into the consequences of calling any photography abstract. For those who place a great deal of importance on the photographs we make (especially if we’re called artists), it’s worth taking the time consider how word choice prepares our audience to view our photographs and how it can affect our own perceptions. 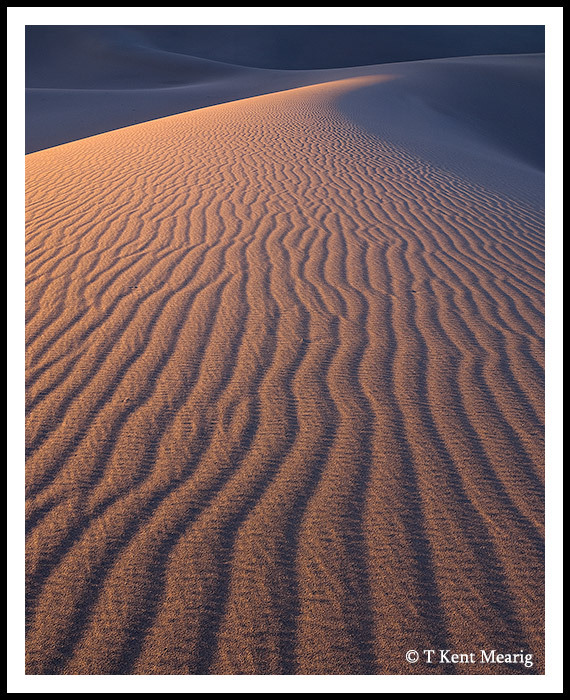 "Sandscape" - I would be surprised if anyone who has seen sand dunes before could look at this image without immediately identifying the subject. The patterns and implied perspective of ripples in the dunes are emphasized by camera placement, but they are grounded in the greater structure of the dunes shown at the top of the photo. To my ears, the word “abstract” signifies an attempt to separate the resulting image from whatever objects were actually there before the lens at the time when an exposure was made. Then think about the goal of a nature photographer. Almost exclusively, our desire is to present some insight into the subject that is being photographed, whether sparking an intellectual understanding or an emotional response. If you accept something close to these definitions, it’s no wonder a nature photographer would feel that while an “abstract” photograph may please their clients, it can’t really bring the personal satisfaction they get by laying out a landscape as a clear and worthy subject. 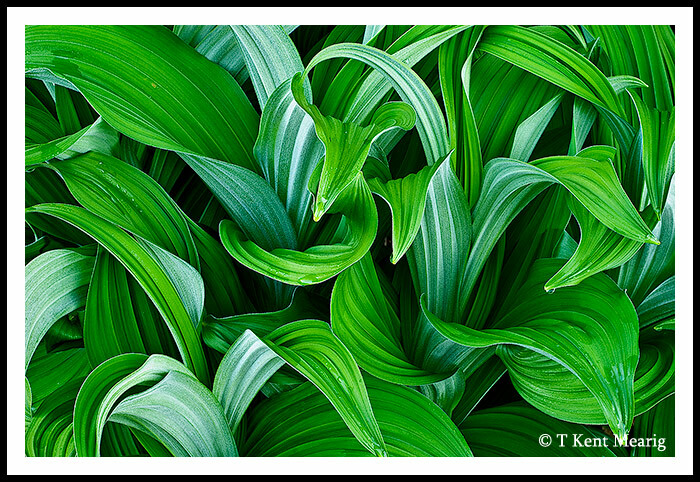 "Veratrum #1" - The identity of a subject is even less of a mystery when it's something that has been photographed as often as Veratrum ("corn lily") leaves. But a "study" doesn't rely on mystery the way an "abstract" does. So why would other nature photographers, with the same overarching goals, find the deepest fulfillment in isolating the lines, colors, textures, and shapes of their natural subjects? Are they functioning with some kind of artistic schizophrenia? Not exactly. Personally, I don’t perceive a single one of my photographs as “abstract”. Even at the times when I’ve wanted an image to suggest something entirely different than what was literally in front of the lens, I still don’t want the viewer to miss what is actually there…making the suggestion. Instead of trying to separate the colorful patterns of the ocean’s surface reflections by isolation, I isolate the reflections in order to focus attention on that specific subject. People are generally likely to overlook the very best of what our visual surroundings have to offer, and the tendency is only compounded when viewing an artificial representation of the world, like a photograph. While there may be splendid nuances nested inside the vibrant sunrise scenic, they are often difficult to engage with in the midst of everything else going on. Seeing the best the world has too offer requires study, and study requires intentionality. This is precisely where the photographer comes in. A little intentionality of the part of the photographer (one who has trained him/herself in seeing through a great deal of practice) helps the viewer to make that first, sometimes most difficult step. 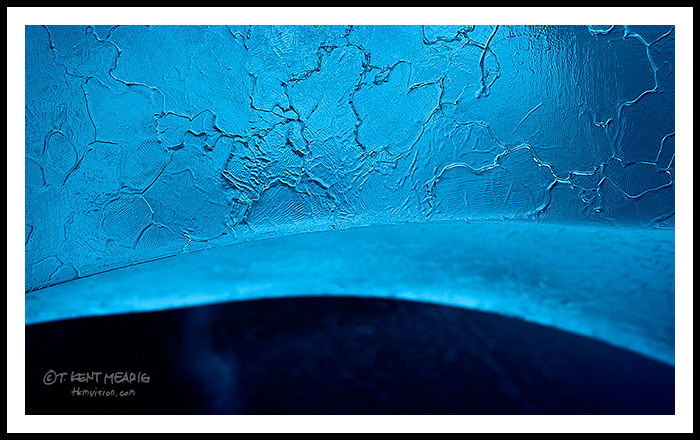 For this reason, I choose to wholly replace the word “abstract” with the word “study” in all reference to my photography. It’s more than semantics because calling an image a “study” helps to reveal my intentions, and as much as I know we like for photographs to “stand on their own”, I can’t convince myself that clarifying artistic intentions is at all detrimental. If my thoughts make sense to you, feel free to join me in stepping out from the cloud of misguiding terminology. Who knows, maybe you’ll even feel less inhibited in creating a very valuable style of nature photography. "Craftsmanship #6" - This photograph, in spite of its bold shapes and large out-of-focus area, is primarily about showing people something they will probably witness nowhere else. I think there are even people who have been in this cave at the same time as me without having any idea that these mesmerizing details existed right above their heads.